Pinoy Pride 11 - Melindo VS. Esquer known as Pinoy Pride XI: Philippines vs. The World. This page is intended for Melindo VS Esquer fight on Pinoy Pride 11 with fight updates, fight results, ticket price, pinoy pride 11 Philippines and Waterfront Hotel and Casino venue are here on this page. Optional and to be updated are the Pinoy Pride 11 on live streaming free, Melindo vs Esquer live streaming, Melindo Vs Esquer fight results winner, Melindo vs Esquer full video replay download, Pinoy pride 11 live streaming, Pinoy pride 11 fight results, and pinoy pride video reply - said that's an optional to be updated here.Who won the Melindo vs Esquer fight? Pinoy pride 11 winner. Milan “EL Metodico” Melindo of Philippines defeated Juan “Panterita” Esquer of Mexico via 7th round Technical Knockout(TKO) and still the WBO Intercontinental flyweight champion. All Team Philippines sweeps the World. Congratulations to all the Filipino rising star boxers of Pinoy Pride 11: Philippines VS The World! The Pinoy Pride 11 of Melindo vs Esquer fight entitled as the "PINOY PRIDE XI: PHILIPPINES VS THE WORLD" schedules this January 28, 2012, Saturday 6:00 pm at the Waterfront Hotel and Casino, Cebu City. 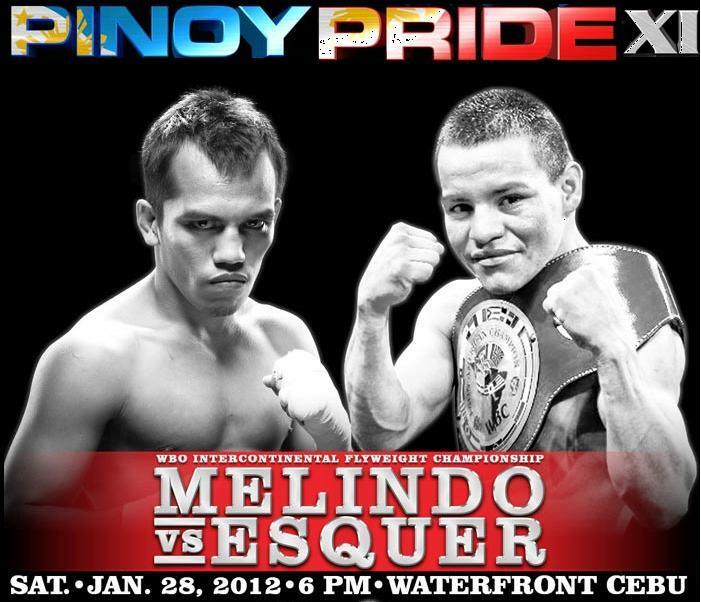 Note: Full video replay of Pinoy Pride 11: Melindo VS Esquer will be posted here in the next few days. Just don't forget to check this site for you to watch the video replay of Pinoy Pride 11: "Philippines VS The World". Thanks. The Filipino boxers wanted to prove their skills and spirits on this Pinoy Pride 11 fight are Milan "El Metodico" Melindo (25-0, 9 KOs)- fighting for the main event against Juan Esquer. Lorenzo Villanueva (21-0, 20 KOs), Mhar Jhun Macahilig (13-1, 7 KOs), Joseph Von Minoza (12-2, 5 KOs), and Alvin Aresgado (1-0) as the Team Philippines of this Pinoy Pride 11: "Philippines VS The World" promoted by ALA Boxing, the Filipino boxers will go up against these fighters from Mexico, Thailand, South Korea and Japan. Melindo will face Juan Esquer (won 27 (KO 21) + lost 9 (KO 3) + drawn 2). While Villanueva is against Mexican Diego Ledesma (18-4-2, 12 KOs). Then Macahilig with the former world title contender Kaichon Sor Vorapin (25-10, 9 KOs). Meanwhile, Minoza for the South Korean champion Yoo Shin Kim (8-2, 6 KOs), and Aresgado performs with Kazuya Harada (0-1) of Japan. Go team Philippines and team World! Let's raise the banner of boxing for greatness as a tradition even in the old Filipino boxing tradition. You are our soldiers of this sports! Let see what will happen if team Philippines sweeps all or not. For you to watch Pinoy Pride 11: Melindo VS Esquer, the fight will be watched her on Philippines local time only on ABS CBN Kapamilya this Sunday, January 29, 2012 starts at 10:00 am in the morning and it will be aired on the Sunday afternoon only at Studio 23 network. If you want to see Pinoy Pride 11: Melindo VS Esquer on live streaming or internet streaming via Philippine local TV, you can watch it also right here. Stay tuned for more fight updates, fight results, and others of Pinoy Pride 11 which will be posted right through here. Thanks. Please like PinoyThinking on Facebook. Thanks!